Supporting parents and working to change the system brings meaning to advocates’ lives. But it’s also painful work. 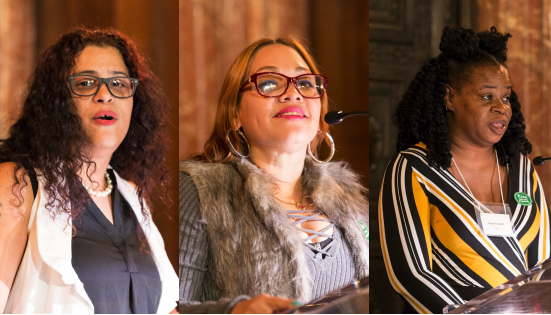 Here, Rise Training Director Jeanette Vega, Senior Parent Leader Nancy Fortunato and Parent Leader Keyna Franklin explain their own journeys and the support they believe all parents need to lead change. Both Jeanette and Nancy began at NYC’s Child Welfare Organizing Project, the first parent advocacy and peer support organization in the country. Fortunato: When I was a parent affected by the child welfare system, I understood what it was like to feel powerless, shamed and judged, but I had no knowledge of how to advocate for myself and my family. I entered CWOP’s parent advocacy training program because my experience with the system left me wanting to empower myself and give back to parents like me. It was an inspirational experience. There were about 10 parents and we quickly bonded because we all knew what it was like to have ACS come into our lives. Speakers came to teach us the history of the system, how it works and how bias and racism affect families of color and the LGBTQ community, while lawyers explained the legal aspects of the system. The training helped me understand that many families in my community fight adversaries in many systems, like the police, the schools and mental health services. It helped me put myself in the parents’ shoes while also giving me the ability to work with professionals in the system. Most of all, it gave me a feeling of support, and that gave me the courage to stand up for myself and my family and to fight for other parents and their rights. Vega: Attending rallies and going to City Hall with CWOP to give and hear testimony helped us understand the big picture of what we were fighting for. We learned to not be afraid to share our perception of the system. Through CWOP’s training, I also began writing for Rise. I was very reluctant to tell my story. Most people I knew didn’t even know my son had been in foster care! As I began to write, my tears would roll down. But other advocates encouraged me to share my experience. When I finally told the heartfelt story of my son’s removal, I could feel my heart not hurt as much. Fortunato: When I wrote my first story, the challenging part was going back to that moment when ACS was involved with my family. Some of those memories you really don’t want to remember. But it was a healing process as well. It sat with me, and then it hit me, “I’m really done and it’s over.” I saw that I was able to stand strong in the midst of chaos. Seeing on paper how I had overcome all those struggles also helped me better understand how to build other parents up. At Rise I’ve also participated in two public speaking workshops. It was challenging because I’m not an eyes-on-me type. But the public speaking director taught us breathing techniques. Sometimes she’d put a song on and have us stand in the center of the group and move to the rhythm. It was to get us comfortable being in the center without feeling like, “Oh my God, I’m going to mess up.” Those workshops gave me the courage to project my voice. Vega: In 2008, CWOP started training parents to work as Community Representatives in Child Safety Conferences, where the decision is made whether to remove a child from home. The Community Reps help parents advocate for themselves. During my first conference, I had flashbacks of my own case, but CWOP prepared us for that and taught us how to focus on helping the parent. Because of CWOP’s training, I knew what ACS considered a safety concern. I was able to coach parents into committing to address those risks so that their children wouldn’t be removed. I used my book of resources to call service providers from right inside the conference. When ACS made a decision that we didn’t agree would benefit a parent, we were trained to call people in authority to discuss it. At first, we were seen as overly aggressive, but over time ACS saw that our work helped bring down removals in our community. Fortunato: I also worked as a Community Representative. When I had my first client, I was very nervous. I didn’t want the parent to see me as another person getting into her business. My training allowed me to step back and remember that I was there to be a support, clarify information, help parents stay calm, be open-minded and get whatever resources they needed. Vega: Four years ago I started working at Rise as a parent leader, and now I’m the Training Director. We train child welfare professionals to build positive relationships with parents, work with parent advocates across the system to bring their ideas into Rise’s advocacy and speak publicly about ways to reform the system. Fortunato: At Rise, I present regularly to lawyers, caseworkers and CPS workers, judges, CASA. People need to know what parents go through when they are facing the child welfare system. For me, the message is to treat people with humanity and respect and to understand that people should not be guilty if they made a mistake but should be lifted up to overcome their challenges. At the beginning, the hardest part for me was reading other people’s stories out loud that were part of our presentations. Those stories really touch your soul; they kept bringing me back to my own moments of struggle. There were times when I would hold my breath and just say to myself, “You’re not going to cry right now.” A few of us always present together, and when we notice one of us getting emotional, we gently put a hand on a shoulder, or say, “You got it. Just take your time.” After presentations, we go to a coffee shop to talk about how we felt so that we can go home in peace. My training allowed me to step back and remember that I was there to be a support, clarify information and help parents stay calm, be open-minded and get whatever resources they needed. Vega: At times I’ve been criticized for working too closely with the system, allowing the system to use my voice as an image of change when the system hasn’t really changed that much. It’s complicated because there are times when I also ask myself, “What am I really doing being so connected to child welfare staff?” Still, I believe that I am influencing the system from the inside. I believe my voice needs to go as high as I can take it so that people in authority understand how we can do so much more for families. Franklin: One part of my work at Rise is assisting Jeanette in running Rise’s Parent Advocate Leadership Group, a group of 12 advocates who work at different foster care and legal agencies throughout NYC and come together once a month. We talk about what steps we’d like the city to take to change conditions for parents facing the child welfare system and the role parent advocates should play. We want to see advocates funded to be out in the community, like schools, shelters and hospitals, to keep families from ever coming into the system. We’ve also pressed ACS to fund more parent advocates. Right now, many agencies only have one advocate for hundreds of parents. Advocates would have more impact working within foster care agencies if they could meet parents from the beginning and stay all the way to the end, even after reunification. It’s important that ACS and the foster care agencies hear from parents and advocates like we do at Rise. We encourage foster care agencies to get feedback from parents, and have parent councils, where agency leadership can hear directly from parents what’s working and what’s not. We’ve also asked ACS to start a Parent Advisory Council that brings parent advocates together regularly to share their insights and work with leadership on change. In Rise’s Leadership Group, each meeting, we eat. We laugh. We make jokes. Advocates talk about their advocacy journeys, which help them reflect on why they stay committed to this work. They also share what’s on their minds and discover what they’re thinking in common. Fortunato: As a parent advocate who has seen many sides of this system, I know how much parent leaders need community. We need places where we can share our struggles and ideas, and decide as a group how to make systemic change. When parent advocates don’t have that, we can feel just like parents in the system: powerless, and like there’s no justice. Vega: All the work parent advocates do to change the system—from supporting parents, to advocating for legal change, to speaking out about what’s broken in the system, and even to letting the system know when it’s done something that has helped— is needed. The more parents stand together the louder our voices will be, and that we will help create a true system of support for families.